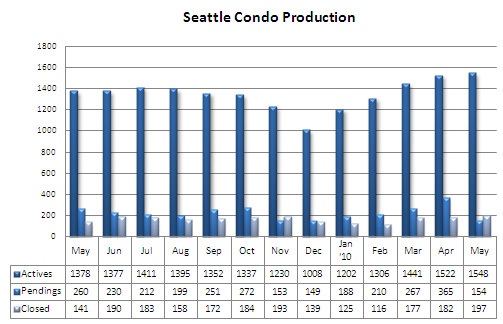 The May 2010 Seattle condo market figures showed just how significant the home buyer tax credits were. The most indicative statistic was the number of pending transactions last month. In May, there were 154 transactions that went under contract while a month before there were 365 pending condo transactions rushing to meet the April 30th tax credit deadline. That’s a one-month drop of 57.8%. Compared to last May, pendings were down 40.8%. The number of closed sales increased as expected, up 39.8% above the same period last year and 8.2% over April. Though, considering how many pendings there were in April, the 197 closings in May was lower than anticipated. That might have been affected by short sale transactions, which takes longer to close and have a higher failure rate. 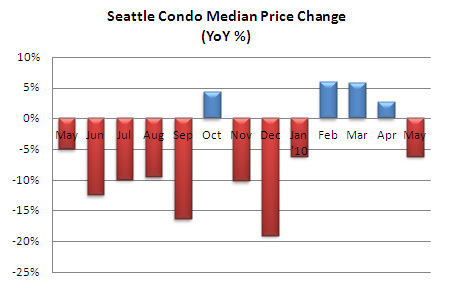 Compared to last May, Seattle’s median condo price dipped 6.25% to $285,000, reversing an 3-month year-over-year appreciation trend. 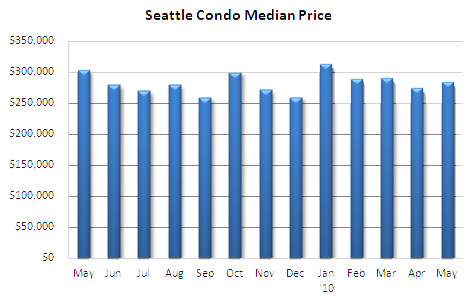 However, the median price has been stable, essentially plateauing over the past 4 months. Inventory continued to rise with 1,548 active listings in May, which reflected a 1.7% increase over April and a 12.3% increase compared to the same period last year. That rise, combined with the drop in pending transactions, resulted in a massive jump in the inventory supply rate to 10.1 months. 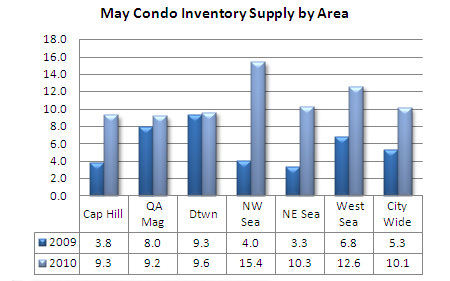 Add in the unlisted new construction units and we’re closer to 14 months of inventory. As the graph below shows the inventory rate is quite volatile, though, it’s likely to remain in the seller market range through summer. Inventory is now up to 2008 levels, which may result in further price fluidity and help sustain an active marketplace as buyers have more choices. As there are two schools of thought on calculating the inventory supply rate – either using the pending transactions or closed sales methods – I’ve updated the graph to include both. The inventory supply rate is calculated by dividing the number of active listings by the number of pendings or closed units. I use the pending transactions method which shows a significant increase. On the other hand, the closed sales method indicates a plateauing trend. Hopefully numbers keep getting better and better. I know in TX the market is looking better and better day by day. That’s not the case here at all – I just shorted my condo (Mezzo) and 5 months later it is NOW appraising for what I shorted it for (and I REALLY priced it to sell quick). Bought = 345 Sold = 240 (when I sold it it was appraised for 270, now it’s appaised for 235) YIKES. Great info! I wonder how much longer the price will be dropping overall! 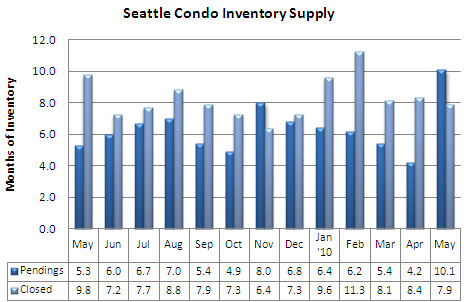 If you want to check out some Seattle numbers to compare to the overall real estate market trends check out this link!